Recorded in various spellings as shown below, this is a surname of medieval Norman and French origins. It derives from 'aveline', the Olde French word for the hazel nut, and was used for many centuries as a female baptismal name of endearment. Introduced into Britain after the Conquest of 1066, the name rapidly achieved considerable popularity, and in the early days was closely associated with the female members of the Norman monarchy and nobility. The personal name is recorded in 1175 with that of Avelina, believed to have been the prioress of Holme in Norfolk, whilst later developments and recordings of the surname include Reginald Avelyn in the tax subsidy rolls of Sussex in 1296, and the Reverend Andrew Avelyn of Norfolk in 1489. Other examples taken from surviving church registers of the city of London include George Eveling who married Elizabeth Ryvers at St. Brides, Fleet Street in 1600, Abraham Evelin who married Jane Wraxall in 1635 at St. Botolphs, London, Charles Evelyn christened at St. Peters, Pauls Wharf, in 1648, and the dialectal of James Havelin who married Susanna Ford at St Dunstans in the East, Stepney, in 1693. He was we believe, christened as James Avelin at St James Clerkenwell, in 1662. 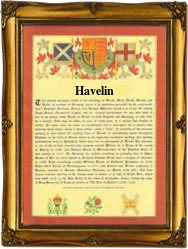 The first recorded spelling of the family name is shown to be that of Henry Avelin. This was dated 1279, in the Hundred Rolls of Cambridge. Throughout the centuries, surnames in every country have continued to "develop" often leading to astonishing variants of the original spelling.